Heat oven to 350°F. In large bowl, beat butter, powdered sugar and vanilla with electric mixer on medium speed, or mix with spoon. Stir in flour. Divide dough in half. 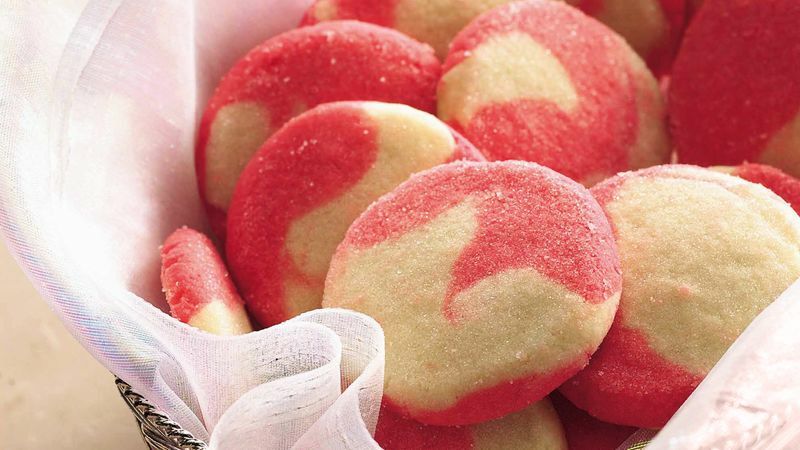 Stir peppermint extract and food color into one half of dough. Divide each color of dough in half. Shape each piece of dough on generously floured surface into rope, 12 inches long. Place 2 ropes, 1 red and 1 white, side by side. Twist ropes. Repeat with remaining 2 pieces of dough. Cut twisted ropes into 1/2-inch pieces; shape each into ball. Place about 1 inch apart on ungreased cookie sheet. Flatten to about 1/4-inch thickness with greased bottom of glass dipped in granulated sugar. Bake cookies 7 to 9 minutes or until set. Remove from cookie sheet to wire rack; cool. Paste icing colors give the brightest colors. Decrease the amount of liquid food color to about half when using icing color. For this recipe, use 1/8 teaspoon paste icing color, adding it to the dough with a toothpick.